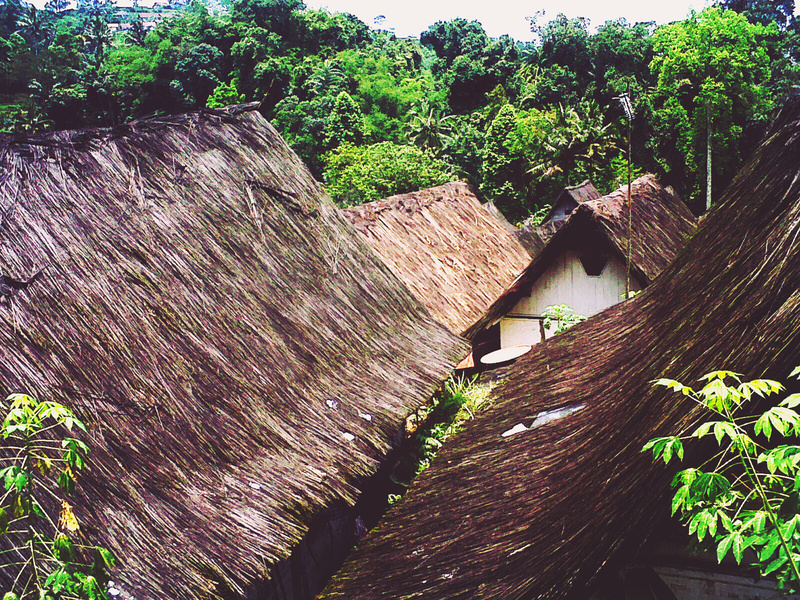 Naga village was located in the area of Neglasari village, Salawu district, Tasikmalaya, West Java, Indonesia. Between Tasikmalaya and Garut, this famous village was unseen. It was a small village under the stairs. Even to reach there, we had to go down about 439 winding stairs–according to my friend’s count. No one knows about the exact amount of the stairs. It could change every time, and it could be different for everyone, they said. It was hard to believe. I wanted to prove it, but I didn’t get a chance to do it, I’ll tell you why. To be honest, I wasn’t really excited at first to visit some kind of “traditional village”. I meant, seriously, you could imagine how disgusting all matters relating to a village were, especially traditional village. Moreover, the worst thing could be, bad signal. But this one, made me curious, we were going to visit Naga Village, or could we call it “Dragon Village”? Are we going to hunt dragons there? Just like “How To Train Your Dragon” movie probably. But yeah, we’d see—I thought so. It was a fine wet February where everyone brought an umbrella on their bags. We were ready to our first visit to what my teacher called as “Dragon Village”. At the time, of course no one would believe if there was a real dragon inside it. It was obvious, there’s no such thing as dragon these days—wise people said. He—my teacher—told us stories behind the village. He said according to the legend, the forbidden forest was sacred. No one, not even people from Naga village would dare to step on the forbidden forest because of pamali. Whoever uses all of his courage, risking his life by entering the forest, he won’t be returned. Returned means that there is ‘something’ that might takes you, and "it" won’t let you out. This creepy story didn’t scare anyone, unfortunately. So, the time had came, my first experience to visit a "traditional village" with all its mystery and legendary tales. I was just a skinny girl, carrying a huge bag on my back. The journey was quite long, we had to go through the mountains, through winding roads, and you could see on the right and left was a creepy chasm. They even put a warning "Be Careful! Prone to Accidents" and this was one more thing that I hated, traveling without going through the toll road. Why didn’t they make toll roads in every corner of the earth? and the worst thing was, everyone seemed to enjoy this trip. They sang happily without worrying about this slippery road. In the meantime, I prayed incessantly along the way, and hoped we would soon arrive at our destination. Finally after a long and dramatic trip, we arrived at the destination, Naga village. Ever since you got out of the bus, you would see a huge monument in the form of kijang–a traditional weapon from West Java. There was also a parking lot, and small shops. “So, where is the village? Where are the stairs?” I asked myself. It turned out we only had to walk a few more meters to a walking path, and finally, a few hundred meters down you would see below there were a stretch of rice fields, the river flow was also very clear, and green trees are lined up across there. Thank God, it was not rain because the sun made this scene had a warmer, but cheerful tone–of course, that was what my friends said. It was too far, so I couldn’t see it clearly. As I told you before, I hated outdoors, and I hated something "traditional", because they had so much bugs. However, you wouldn’t realize it when you had already passed the stairs and met the turning. A loud "Woaaaa" was all I could hear as if it was the soundtrack of a movie scene. Then you just froze, just because you were fascinated by the view. You would enjoy the rice fields, rivers, traditional houses, and even you would wish someone would kidnap you into the forbidden forest just because you were that curious and wondering if there was a real sleeping dragon deep inside it. That was exactly what I felt. A few seconds later, everything really felt as if it was a blink of eyes, short and fast. You didn’t even realize that you had really reached the end of this way. I had finally arrived at the end of these four hundred steps. Just a few meters away, you would arrive at the village hall. The buildings seemed to have almost the same shape each other. That was what made this place unique. There are 111 buildings in Naga village which consists of 109 houses, a mosque, and a meeting hall building. The tour guide said that why is this place was named “Naga” is because this place is surrounded by walls. Walls mean gawir in Sundanese, na-gawir means “at walls” in English, so people just called the small part, and backformed it as Naga. That was why this village called as “Naga Village” or Kampung Naga, which there was no connection at all with dragon. To be honest, I was disappointed. I still hoped they hide a real dragon in the forest or even just their eggs in their house. It was a beautiful village, with beautiful people, and unique traditions. They did similar jobs such as farming and hunting like other traditional villages, but they also had unique rules and laws that no one can break it. One of their unique laws was; if you were a member of this village and you just got married, then you had to move outside the village. There were only limited houses in the village, so you may come back if you were older or someone was dead inside the village. The people here welcomed us nicely, and one of the most shocking thing was that they speak English! There were so many tourists came to this village, so the people here have to develop their ability to communicate with the tourists, unbelievable! Having fun at this village with the nice people made me forget what I went through before we arrived here. I was too excited yet too tired, and the sun seemed to shine too brightly. I didn’t realize that it was already our time to go back upstairs. We hadn’t even had lunch, and my teacher said that the lunches were available up there in the bus. When I tried to climb upstairs, everything turned black all of sudden. I thought the sleeping dragon was awake and it caught me, because it felt like flying. I was laying in the back of the dragon, it took me and it had so many hands. It also spoke as if it was an echo. The echo called my name, but still, everything was still black. I also smelt some various scents. When I heard someone was going to get water and then watering my face, my eyes were open all of sudden as if something “inside me” forced my eyes to open. Then I saw familiar faces that seemed to worry. One of my friend gave me water to drink, and then they told me that I fainted on my way upstairs. I realized a few moments later, there was no dragon here.